Do you want to be the first to know what is happening in Grant County that can affect anything from your safety to your commute? The Grant County Emergency Management Agency and Nixle are ready to send you weather & specific hazard updates. Grant County Emergency Management is utilizing a new communications service that allows us to send important, valuable community information directly to residents using the latest technology. You choose the information you want, for the locations you want, from urgent public safety alerts to less time sensitive advisories and community information. The messages can be sent specifically to residents registered within a ¼ mile radius, giving them the opportunity to receive trustworthy information relevant only to their neighborhood. You choose how you want to receive the information, whether it’s over your cell phone by text message, by email or over the web (or all of the above). You stay connected to what is happening in the community at locations that are relevant to you. Registration is FREE, SIMPLE, and SECURE! While we do not issue a large volume of messages, we believe that this will be a helpful tool in directly alerting Grant County residents of events relating to public safety, general advisories, and in the event of an emergency - critical or useful information. Only specific warnings for Grant County residents will be sent out via text such as: tornadoes, severe weather, flooding, travel alerts/watches/warnings, and hazardous material incidents. Attached to these messages will be the appropriate actions to take to stay safe. Grant County also has the Nixle system set to automatically send a message to users for the following National Weather Service notifications: TORNADO WARNING, SEVERE THUNDERSTORM WARNING and HAZARDOUS MATERIALS WARNING. This means you will receive these weather notifications as soon as the National Weather Service issues them. Adding Nixle to our other means of communications will allow communications to go to more people directly and quicker and we hope that all residents who have the ability to subscribe to this free service will do so as we strive to work together in partnership with residents to improve the quality of live within Grant County. Please note that for those choosing to receive messages via SMS text that standard text messaging rates do apply and you should check with your carrier. Do you travel? Have to commute for work? Visit another town for shopping? Want to know what is going on in another area? After you confirm, you can reply with up to five (5) other zip codes that you might want to receive alerts. We encourage you to share this information with friends and neighbors to spread the word! Nixle is a community information service provider built exclusively to provide secure and reliable communications. It is the first authenticated and secure service that connects municipal agencies and community organizations to residents in real time, delivering information to geographically targeted consumers over their cell phones (via text messages), through e-mails and via Web access. Nixle has secured a partnership with Nlets (the International Justice and Public Safety Network), allowing local police departments nationwide to send immediate alerts and advisories. To learn more about the Nixle Alert system, please check out their website at Nixle.com as well as the Frequently Asked Questions (FAQ) located at the bottom of this page. Because text messages must be kept short, a link will be included in the text message directing you to the web portion of the message, if you are using a smartphone, which will go into greater details on the situation. Also you can view any current message issued by going to Nixle.com and in the box that says "Enter your zip code to see what's happening where you live" enter your zip code. 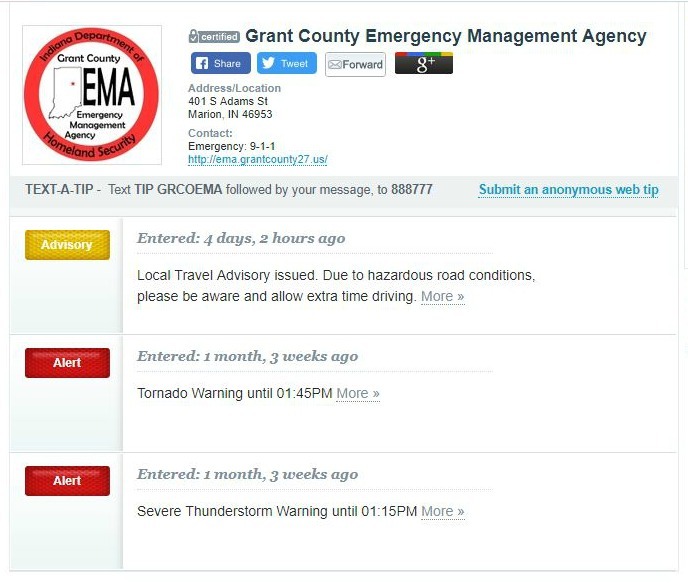 You will then be able to click on and view any active message from Grant County Emergency Management. Nixle is not intended to replace emergency warning systems. Nixle is an internet based platform therefore messages may be delayed in times of loss of connectivity. Nixle and its services are not affiliated with the Grant County EMA in any way. The Grant County EMA, its officers, agents, employees and contractors: (a) Do not guarantee that any particular message or type of message will be sent or that you will receive every message. (b) Are not responsible for lost or misdirected messages, changed email addresses or phone numbers, function of your computer equipment, phone, or software, or messages that fail to be transmitted or received due to problems with servers or transmission (e.g., cable, telephone, satellite, etc.) or human error. (c) DISCLAIM ANY AND ALL WARRANTIES, EXPRESSED OR IMPLIED, INCLUDING THE WARRANTIES OF MERCHANT-ABILITY AND FITNESS FOR A PARTICULAR PURPOSE. Nixle is a community information service that alerts you to emergencies as well as important community information via cell phone texts, email and the web. The Grant County EMA provides these alerts through Nixle. Alerts are also published on Twitter and Facebook. Until now, there has never been an authenticated and secure service that connects municipal agencies and community organizations to their residents in real-time, with the same ease and in the same way that current services such as Facebook and Twitter provide users with an unauthenticated platform for connections. Nixle solves this problem by providing ONE standardized service for consumers to receive immediate and credible neighborhood-level public safety and community information, via SMS, email, or web. Nixle is Free. It is important to note however standard text messaging rates may apply by your phone carrier. Most data plans include unlimited texting and if this is true for you then you will not be charged additionally by your phone carrier. If you are limited to the number of texts you receive each month you may wish to only sign up for email alerts and notifications. Anyone can view information by going to Nixle - Grant County Emergency Management Agency without registering. However, to customize the information you receive and the locations you receive it from, in addition to receiving information by text message and email, you must set up an account. Once registered, you can personalize your locations and your preferences, making the service fit your needs. How do I send the keyword GRANTEMA to 888777 to sign up? Compose a new text message. You will receive a confirmation you are signed up. How do I customize who I receive alerts from and how they are delivered? Simply log into your Nixle account and use the "Settings" tab to configure how messages are delivered and what agencies you wish subscribed to. What type of alerts and notifications are there? Alerts - Emergency type alert usually life threatening. Advisories - Time-sensitive and non-time-sensitive important neighborhood to community level information. Community information - Day-to-day, neighborhood to community-level information usually non-time-sensitive. Alerts & Advisories - sent via text and email. Community information - sent by email only. You can further customize how alerts are delivered by logging into your Nixle account. How are Nixle Emergency alerts different from breaking news alerts? Local emergency response agencies will only activate the system when an emergency or unexpected situation occurs that requires the public to either take protective actions or to have a heightened awareness. This will vary depending on the number of notifications published. The service is simple to change SMS (text) and email options by logging into your account and adjusting how you want to receive notifications. Can anyone track my location by using Nixle? Is my contact information private? Will I be contacted by third parties? I keep getting alerts while I am sleeping. Is there anything I can do about this without unsubscribing? Yes, log into your Nixle account and customize what time you do not wish to receive alerts. Sprint often disables access to all short codes (5 and 6 digit phone numbers) from their handsets. If you are a Sprint customer, and you receive a message such as “Message Failed. Shortcode may have expired or shortcode texting may be disabled,” you may need to contact Sprint to enable your phone to send and receive messages from short codes. Nixle uses the 888777 shortcode to send you timely messages. You may contact Sprint by dialing *2 on your cell phone or visiting www.sprint.com. T-Mobile often disables access to all short codes (5 and 6 digit phone numbers) from their handsets. If you are a T-Mobile customer, and you receive a message such as “Message Failed. Shortcode may have expired or shortcode texting may be disabled,” you may need to contact T-Mobile to enable your phone to send and receive messages from shortcodes. Nixle uses the 888777 short code to send you timely messages. You may contact T-Mobile by dialing 611 on your cell phone or visiting www.tmobile.com. Go to Nixle - Login and look for "Forgot my password". Click on it and enter your email address or phone number and a new password will be sent to you immediately. If you signed up by keyword such as GRCOEMA, Nixle will send you a temporary password by texting PASSWORD to 888777. Log in at Nixle - Login and click “Account.” On the “Account” page, click on “Change My Password” and follow the instructions. Before unsubscribing consider logging into your Nixle account and adjust the agencies you are subscribed to and the how you receive the messages . To do this login at Nixle - Login and click "Settings". You also have the option to eliminate all SMS messages under the "account" tab should you wish to completely unsubscribe. If opted in to texts only you may also text STOP to 888777 to unsubscribe. The SMS text will be sent to an end user’s mobile device. It will also appear as a message summary in the email version of the message. The Full Message Text is sent to a user’s email and is instantly available to any user online at Nixle - Grant County Emergency Management Agency.